This discussion of the cosmology and foundations of the Crossroads Setting gives depth to many of its unique features. Starting off with the creation story that explains its unpredictable magic, this section also explores the mysterious Ring of Mist that surrounds Crossroads and the many theories of creation which provide a range of story hooks and avenues for connecting Crossroads to other settings. In the beginning everything was Essence. Essence is what we call the rawest form magic. It is creative and chaotic. The Essence was everything and it was nothing. And it existed like that for eons upon eons. Finally, by random chance, there was a tiny spark of order and the First God came into existence. As the First God surveyed what was around them, their thoughts rippled through the Essence, shaping it into earth and air, fire and water. More ripples created the sun, the moon, and the stars. Finally, life itself was born. This was the First Creation. But raw Essence is unstable and once life had been created, there were more thoughts to shape it. These new thoughts were smaller, but they were numerous, and the Essence changed a little in response to each one. The First God tried to hold everything stable with the power of their thoughts, but all of creation is a lot to think about and there were so many other thoughts constantly reshaping it. Finally the First God could not hold the Essence stable anymore, and the First Creation tore itself into pieces and was destroyed. Then the First God had a new idea, and that thought rippled through the Essence, bringing the Many Gods into being—each with a different nature and gift. Together the Many Gods divided the raw power of the Essence into the Magical Domains. Next, using these domains as both tools and materials, the gods wove a new world, the Second Creation, with laws to govern it and keep it stable. One of these laws is that the gods themselves may not directly manifest within the world. This protects creation from the rips and tears that would inevitably be caused by their immense power. Instead, the gods confine themselves to working through their followers and maintaining those parts of creation which are their special areas of interest. We are living in this Second Creation and through study we have learned that small fragments of the First Creation escaped its destruction. These fragments have become embedded within the substance of our world. As remnants of that original world, they know only the form that the First God gave to them. It is uncertain how being embedded within the substance of the Second Creation has affected them, but they do seem to be more stable than they once were. Because these fragments are so similar to Essence, they are potent, causing these areas to be usually rich in magic. They are also the reason why these places rarely follow the Laws of the Gods, because those laws did not exist when the First Creation was made. There is, however, one large fragment of the First Creation that escaped its destruction. This fragment has become the Other Realm, a place of beauty and danger that only touches the fabric of the Second Creation in a few places. 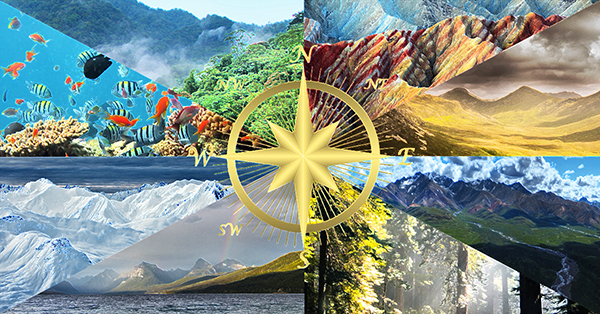 Though the points of contact are few, it is believed that many of the peoples and creatures that now inhabit Crossroads originated in the First Creation and only came into Crossroads through these connections to the Other Realm. The Magical Domains are both the threads from which the world has been woven and the tools used to do that weaving. Because of this, the magic of each domain can be used like a tool to manipulate and reshape its own threads. However, the threads of different domains are often intertwined, meaning that changes made to one domain can have unexpected results on others. All of this constant reweaving would make reality unstable, except that the Many Gods designed the Second Creation to be stable. The threads of the domains have an inherent stability that makes them always remember and return to their original shapes, no matter how many times they have been altered. In addition, the threads of the Second Creation are so tightly woven that changes to the fabric of one area rarely affect other places. Together these two things make it possible for many different people to use magic without upsetting the world’s stability. Because of the inherent stability of the Magical Domains, an anchor is required any time a magic user wishes to create a permanent magical effect. The anchor acts like a knot that holds the domain thread in its new shape. Should the anchor be destroyed, the domain thread would be freed to resume its original shape. The most stable anchors are physical, with orbs being the most common, followed by artifacts, living beings, and everyday objects. Intangible things, such as emotions, promises, duties, or purposes are also capable of anchoring magic. However, intangible anchors are more flexible, which makes them prone to changing over time, and as the anchor changes, so too does the attached magic. It is believed that each person born in Crossroads resonates with at least one Magical Domain. With practice, this resonance can be developed into a connection which allows that person to draw on the magic of their domain and reshape its threads. Depending on the nature of their practice, this connection can take different forms. Some connections are direct, while others happen with the assistance of a god or other powerful being. When a person casts magic they are harnessing the power of one of their domains to reshape that domain’s thread. Doing this means temporarily overcoming a small bit of the Second Creation’s inherent stability. Naturally, this comes with risks. Each Magical Domain contains a piece of the raw creativity of Essence. This is necessary for the Second Creation to maintain its flexibility and resilience. Normally, this flexibility is balanced by each domain’s stability. However, when threads are being reshaped, their creative power can become unbalanced, producing unexpected results. This is the biggest source of magical mishaps, though mishaps can also be caused by unexpected interconnections between the threads. Prayers, words of power, gestures, magical herbs, performances, and sacred items can all be used to add structure to the casting process. This helps maintain stability, as does practice and preparation, but, in the end, mishaps happen to all who use magic. The Ring of Mist is a permanent, oval-shaped cloud that encircles the entirety of Crossroads, separating it from the Outside Lands. It is not possible to go over or under the Ring of Mist; the only way in or out of Crossroads is to go through it. Strange things happen in the mist. Even so, people cross back and forth every day on the many roads that pass through it. Each time a person passes through the mist it gets inside their mind, obscuring some of their memories. They can remember everything they know about the land they are currently in, but the memories of the land they came from are dream-like and incomplete. People can still remember their loved ones and some aspects of daily life, but details about the world and how it works are fuzzy. The mist also seems to take things. Magical objects can’t cross through it. Instead they vanish, only to reappear on the return trip. Similarly, the writing on books, maps, and diagrams also disappears, though the objects that were written upon do cross over, leaving blank parchment and empty books. Upon the return journey the writing reappears. It is possible that there are other things that can’t pass through mist that people aren’t even aware of because the mist prevents them from remembering. What is certain is that people and animals can pass through it, along with raw materials and simple goods. It is believed that some of the groups now living in Crossroads came through the Ring of Mist from the Outside Lands, but that was so long ago that no one knows for sure. There are, naturally, a lot of theories about what the Ring of Mist is and what it is made of. It has been noted that the gateways between Crossroads and the Other Realm are also marked by mist, but that mist has very different properties. In addition, ghosts and other supernatural entities often create magical fogs which they can manipulate. As a result, some think that mist and fog are markers of supernatural boundaries. Another possibility is that any magic that is in a rawer form, a form closer to Essence, will appear as a fog. Others theorize that these are all distinct phenomena that just happen to have similar appearances. Studies designed to answer these questions are ongoing, but with little success. So far the Ring of Mist has resisted all attempts to study it. There are many possibilities for what the Second Creation is and how Crossroads fits into it. The existence of the Ring of Mist brings up many questions, and numerous theories have been proposed to explain it. These theories can be grouped into two main categories: the Single World Theories and the Many Worlds Theories. The Single World Theories are all based on the idea that Crossroads is part of a single larger world that is the entirety of the Second Creation. Among these theories, the Protective Barrier Theory views the Ring of Mist as an ancient barrier designed to protect Crossroads from the outside world. By preventing external magic from entering Crossroads and knowledge from leaving, military invasions are made impractical. Meanwhile, the Forbidden Knowledge Theory suggests that the true function of the Ring of Mist is to keep certain powerful, forbidden knowledge that is hidden in Crossroads from ever reach the Outside Lands. A different perspective is given in the Magical Transportation Theory, which views all of the magic and information blocking properties of the Ring of Mist as an unintended side effect of its true function. This function is to magically connect the trade roads of Crossroads to many different lands all over the Second Creation. Similarly, the Magical Boundary Theory also takes a unique perspective. It puts forth the idea that magic only exists in Crossroads and that the Ring of Mist is simply the boundary where magic stops working. In contrast to the Single World Theories, the Many Worlds Theories are all based on the idea that the Second Creation contains many different worlds that are connected by the roads between them. This would mean that the Ring of Mist is both the edge of the world and the gateway to other worlds. All of the effects caused by going through the mist are a result of shifting from one reality to another. Among these theories, those who follow the Many Experiments Theory believe that the Many Gods experimented in the creation of all of these different worlds, resulting in each world having its own laws and magic. Followers of the Many Pantheons Theory take this a step further by suggesting that each world actually has its own pantheon of gods. Other Many Worlds Theories focus on the way all of these different worlds are connected to each other. The Giant Flower Theory puts Crossroads at the center of creation, like the center of an enormous flower, with all of the other worlds connecting to it like petals. Conversely, the Giant Web Theory thinks of creation as a massive interconnected web of different worlds. In this theory, Crossroads is a world like any other with an average number of connections to other worlds. Unfortunately the mind altering effects of the mist have so far made it impossible to get proof for any of these theories, as the only place that can be studied in detail is Crossroads itself. Studies of the Other Realm have yielded exciting information about the First Creation, but they can only shed limited insight into the nature of the Second Creation. As a result, speculation and study continue indefinitely.